I’m so glad that I keep a well stocked pantry. It’s a buffer against surprises when I’m cooking. Last night, I prepped a Cooking Light Recipe, chicken sate with peanut sauce. I went to open a squeeze bottle of lime juice, only to find that it was open and crusty, even though it was brand new from the store. I had a bigger bottle in the pantry, so I opened that instead. I needed bottled ginger – oops, the one in the refrigerator was opened in June, which was just a bit too old for my taste (I mark the dates of things when I open them). And when did the soy sauce get used up? It’s a good thing I had a back up for that as well. I already had brown rice cooking from the stash that I bring home every few months from the bulk food bins at the health food store. The chicken was on sale, which was why I hadn’t checked all my ingredients before getting groceries. I’m happy that I keep back-ups of most things, the trick now being to make sure I replace them promptly. Having that buffer makes food preparation go much easier and with less frustration when I need something unanticipated. I’m not the only one enjoying a well stocked pantry as a buffer. I found this web over the weekend and spritzed it with some water to make it show up. It looks like the spider has several preserved packages of food for its next few meals. 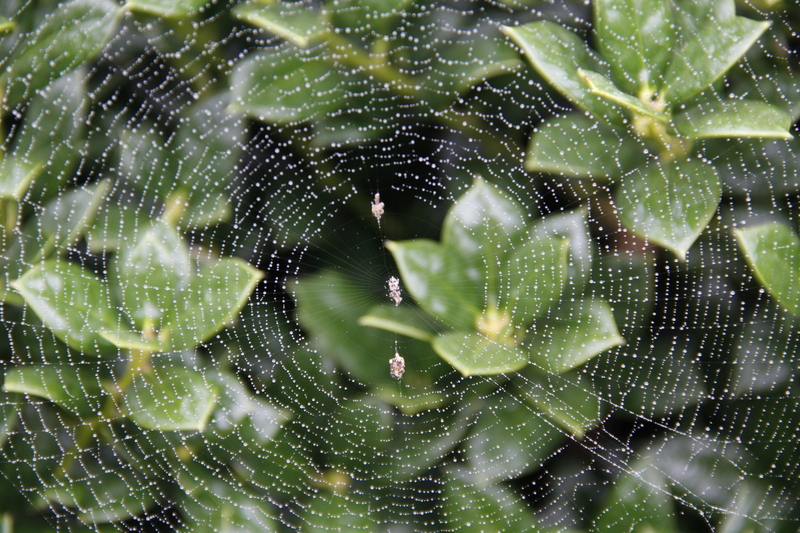 I got the idea to go looking for some webs to photograph from this post by Christine M. Young. Word for tomorrow – ACCOMPLICE. If you prefer to work ahead, see the list for the week under “A Word A Day”. Thank you so much for linking my post :) I’m excited that it inspired you to go looking for some ~ great find, I love the shape of the one you found, I never thought of spraying a web with water, great idea! Great photo! And, I love Cooking Light!! Unfortunately, I never seem to have the buffer for things I need. I am going to have to start working on that. You’re so organized. Good for you!